Online Payment | JEREMY NOVAK PH.D.
Metropolitan Psychological Associates uses PayPal Credit Card services to process your payments quickly and securely. 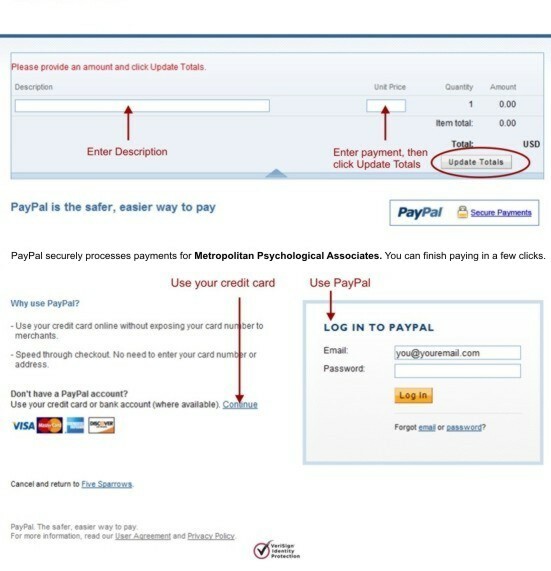 However, you DO NOT need to be a member of PayPal to use this service! Simply click on the "Pay Now" button, below, and enter your information on the PayPal screen as shown in this example - it's that easy! Once you've made your payment, a receipt will automatically be emailed to you.